Redü, D.R. & Zefa, E. 2017. Anurogryllus Saussure, 1877 (Orthoptera: Gryllidae: Gryllinae) from southern Brazil: new species and new records. Zootaxa 4290(3): 559–570. doi: 10.11646/zootaxa.4290.3.9. Reference page. Tan, M.K. & Artchawakom, T. 2017. 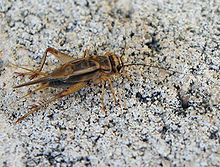 New species of Leleja (Orthoptera: Gryllinae; Gryllini) with first female description for the genus. Zootaxa 4236(3): 592–600. doi: 10.11646/zootaxa.4236.3.12. Reference page.